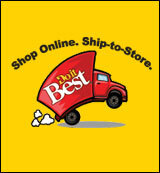 We are a full-service building and home center that strives to provide the best in customer service. For your shopping convenience, we want to welcome you to our website where you can browse items available for pickup or delivery. Stop in or call our store today! If we do not stock the item, one of our friendly employees will be happy to special order the item for you. At Sedwick’s we support American made and Environmentally Friendly products whenever possible.